And that's it. The end of another BDO World Championships. The second of our festive festivals of tungsten is over. It was Gary Anderson last week and now the congratulations go to Scott Waites. If Christmas means darts, roll on December. Goodbye. Emma James: Scotty to Hotty is the world champion. Couldn't happen to a nicer guy. "The operation on the rotator cuff is very hard. You throw a dart and it hits the skirting board. Scott is playing a lot better than he was. You can't do better than being world champion." More from Scott Waites: "Sometimes you walk on that stage and not everything feels right. Everything felt right tonight. "I thought I wasn't scoring high enough to beat Jeff Smith, but he wasn't scoring high enough to beat me. "I just thought 'hit something', and I did. I thought 'just hit this no matter what'." Ant: Well done Scott Waites. Put on an absolute darts clinic, brilliant. "Jeff Smith has played some entertaining darts, even if the final was disappointing - Scott Waites wouldn't have cared." 2016 BDO world champion Scott Waites on BBC Sport: "It seemed a million miles away when I had shoulder surgery. I had six weeks without throwing a dart. That's painful in itself. Now I'm taking the world title back home! "I'm speechless at the minute. I put my heart and soul into trying to win this. Today, I took my chances before Jeff took his. That was the difference. "I'll never give in, but when I'm in front I'll pile those 140s in. Jeff has to catch me and he couldn't hit the doubles before me." Waites is still on stage as Smith heads to the back. The Canadian takes the commiserations, while Waites is posing for pictures. There's no sign of the Lakeside emptying just yet. "Scott Waites played well all week, the two comebacks, and that high checkout really hurt Jeff Smith." "Fighting back would have been a tough ask for Jeff. Scott may say that he doesn't worry about money, he does - he's a Yorkshireman." Neel: Well done Scott Waites!! How gracious was Jeff Smith in defeat though!! Here comes the trophy. Waites gets his hands on the silver and a cheque for £100,000. We Are The Champions plays inside the Lakeside as Waites parades his prize. Once again, Scott Waites is the champion of the world. We're told that Scott Waites' dad is wearing his lucky shirt, the one he wore when Waites won the 2010 Grand Slam. He might never take it off now. Runner-up Jeff Smith: "I found myself trying to make something out of nothing, but the crowd were fantastic. I really appreciate them. "We must congratulate the champion, Scott was incredible - he dug in and made it to the end." More from Scott Waites: "I don't know what will happen tonight, let alone tomorrow. "I play darts for darts, not the brass. It means more to be world champion, sack the money off. "Onwards and upwards now. It might cost me £8 to get my name on the trophy again. Next year, I'll have to come back and have another go." 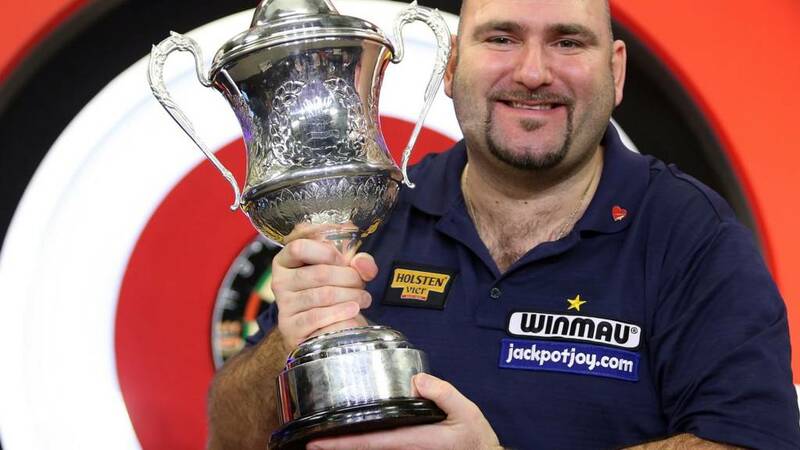 2016 BDO world champion Scott Waites: "Absolutely brilliant. The crowd has been fantastic. "Jeff has been a great sportsman and it was a great game. "I'm flabbergasted. I can't believe it. It's not sunk in." Won with double 16! Scott Waites is the 2016 world champion! A two-time Lakeside winner! He has demolished Jeff Smith in the final. Scotty was just too hot. The Silencer had no answer. Waites with the darts, but Smith just in front after nine. The former champ down to the business end first, but timely 180 from Smith pressures the throw. Waites, though, what is this? 156? T20... T20... D18! He's one leg from the title! Even Jeff Smith applauds. Great stuff. Waites is two legs from the match. A break here would have him within licking distance of the trophy. Smith, though, clings on to the applause of the Lakeside, which is sort of like a big working men's club. If you're from the north, you'll know what I'm talking about. D9 for Smith, he holds throw to huge noise. These are pressure-free legs for Waites. If he holds, he holds. He knows he's going to get plenty of chances to win this match. Incidentally, Waites has only won four more legs than Smith, but they have been at crucial moments. Waites to a finish, leaving 12 as Smith fails a shot at 158. Scotty misses three at D6, but Smith is all over the board. As the crowd get rowdy, Waites looks over his shoulder, then mops it up. Does Smith still believe? The very least he must do is hold throw from now on, then hope for some Waites errors. He's in good shape in this first of the eighth set, a 180 leaving only 30. D15 missed three times, the D6 missed twice. If Waites takes out 65 here, the Fat Lady may be called. He misses D6, allowing relief for Smith. Very good from Waites, back-to-back 140s exactly when he needs them. The Silencer, though, responds by filling the T20 bed. Waites, though, comes for 100. He'll have six darts for 6-1. Two at D20 missed, Waites returns and nails the top lipstick. It's 6-1 and Waites is one set from the title. Let's not forget Martin Adams in 2007. He led 6-0 after the second break, before the late Phill Nixon fought back to 6-6. Adams did hold it though to win 7-6 - but what a final! The Lakeside is engrossed, rather than rowdy. Spectators seated at tables, the odd trip to the bar. Jugs of lager. Iffy scoring from Smith, but Waites unable to take advantage. Still, the Yorkshireman first to a finish, 143. Not taken, so Smith for 135 and the set. He leaves 56 as Waites comes for 50. D16 nailed! Waites is back in charge and will throw for 6-1. Massive leg coming up. So, Waites throwing to stay in the seventh set. He's lost five legs in a row and his scoring has been wobbly. Smith is slightly ahead in this leg and is first to a finish. He'll come for 140 and the set. No shot, but Waites must take 161. He misses T17, so Smith has his chance at 80. One at tops... just too high. Waites, scowling, has one at D16, but it isn't there. Smith? No! Three missed. Finally, Scotty takes D4. It's only a hold, so Smith will throw for the set. Smith has had problems holding his throw after breaking, but a 140 has him down to 76 and a shot at 2-0 in this set. Tops? Yes! One dart into the red bit. This is much. much better from Jeff Smith. Waites looks solid after the break, 161 after nine. Smith, though, is on his tail, and waits on 121. The Canadian gets his chance, setting up 32. Waites for D18 to hold... no. Smith to break... yes! One at double eight. He leads against the darts. The comeback? They're heading back out to very warm applause. Waites will throw first in this seventh set. He's six legs from a second world title. "The first round was disappointing as some of the players we had never seen before and it makes it hard to predict a winner. Over the week it got better though and although the final has been a little disappointing, it can get better." The players have taken another break. I wonder if Jeff Smith wanted it, or would have been keen to keep going after winning the set? He has managed to get on the board with the advantage of the darts, now he has to break the Waites throw. "Jeff Smith still isn't throwing right, because he's under pressure. "The 180s and the big out shots aren't there - there's only been one. It's not explosive this game, it's slow pace in terms of the scoring, and it's only gone quick because it's 5-1 in sets"
Smith has three chances to get a set on the board here. He's loose in the first of them and Waites is making the running towards a break back. The former champ has one at D20, but gives it too many beans. Smith on 161 for the set. T18? Yes. T19? Yes. Surely not? Bullseye? Yes! Jeff Smith wins the sixth set with a 161 checkout! The catalyst? There's only been five whitewashes in the history of the BDO tournament... is Jeff Smith about to become the sixth? When was the last whitewash? For all you stats fans out there, the last whitewash in a BDO final was Ted Hankey's 6-0 win over Ronnie Baxter in 2000. If Waites wins 7-0 here, it would be the first in a best-of-13-sets contest at Lakeside. You have to feel for Jeff Smith here. There's no flashiness about him, he's just turned up to play darts. Problem is, he's getting steamrollered by a Yorkshireman who isn't missing. He has the darts in this set and mist hold his throw, otherwise Waites will be throwing for the match. Scotty for 94, but doesn't get a shot at double. Smith must take tops here... he misses, but is saved by D10. Crucial hold. Two more required. Nipped down to the players' room during the first short interval. Jeff had a quick comfort break and then was on the practice board. Scott did not throw a dart. Can Smith find the scoring that would lead to a crucial break? A Waites 140 gets him to top of the shop, 170. Only one T20, but he'll come back for 72. Double 18 is missed twice, thrice, four times, but not five! Five darts at D18, but Waites doesn't worry. He's 5-0 up! Waites needs two holds for 5-0, but he's hampered by a bounce-out. Smith, though, looks like the height of the mountain is getting to him, the head gas dropped. Forget that, he's back with a maximum, but Waites tickles the tungsten to leave 32. Three at D16... one needed. I'm not sure I can remember the last time Waites was behind in a leg, certainly not when he's held the darts. Smith looking to consolidate, keeping Waites in his wing-mirror. It's an ugly effort, but he'll come for tops if Waites doesn't take 142. One at D11! Just wide. Smith, though, is all over the board. Waites breaks back and is back on course for 5-0. I'm told by one of my colleagues in the press room that Waites' 7-1 win over Tony O'Shea in the 2013 final was done and dusted in 74 minutes. Unless Smith gets going soon, this one might be done even quicker than that. That will have gone down well in New Brunswick, Canada, where Smith hails from. They're four hours behind the Lakeside in case you wondered. There's an episode of South Park called 'Canada On Strike'. The whole nation downs tools. Smith hasn't thrown in the towel here, but he's being pressured by the ruthlessness of Waites. He speeds up his throw, he mutters to himself, but for most of this leg he doesn't look like breaking. Waites for 117 - tops? No, just too high. Smith for 118? Too high again! Waites, though, misses three at the red bit, letting Smith in to clean up. A precious break. Kirsty Parker: Got to hand it to these players, they recalculate a check out faster than I can think of my name. Stefan Dzisiewski: Downside - doing tax return. Upside -DAAAAAAAAAAAARTS! If Waites can break here, it might be the ball game. Smith errs, only 60, but Waites can't punish. Smith, though, is still short of trebles, so has 144 after a 180 gets Waites down to 43. For the set...double 16? No. Double eight? Yes! Waites leads 4-0! Apparently, according to the statisticians, we've just seen the 32,000th dart of the tournament. Smith has the look of a man who could front an indie band. Glasses, gelled hair. He wouldn't look out of place in Weezer. Scotty has no pressure in this leg, racing down to 24. No fuss on the double 12. Big leg coming up. 3-1, or 4-0? Oh, Scotty. Against the arrows, his third maximum of the match pressures Smith, who responds to get down to 161. A possible out, but not taken. Waites on 121 for a break. No treble, so a reprieve for Smith. 80 has to go, but tops not found. Waites in for D12. D6? No! Miles away. Smith off the hook with a clutch double five. If that had been missed, it might have been game over. Stevie Adams Jr: Scott Waites is leading the final, 3-0, with a 90.96 average. Jeff Smith appears to be choking. Time will tell! Smith has definitely come back with greater momentum, scoring better, even if the odd loose darts causes him to admonish himself. Waites, though, has D18 for a 115 checkout. Just too low, almost copied exactly by Smith. Waites for D9... taken with the third arrow. We're on throw in set four. Former Lakeside champion Martin Adams on BBC Two: "I am surprised how Jeff Smith has performed at the moment. I'm surprised Scott Waites is 3-0 up but he's not missing his doubles is he? "Waites has won this tournament once already and he knows what it's all about. Watching him play he looks like a champion. "Jeff needs self belief that he can get that next set and start to close the gap. He needs to come in here next time at 3-3." Has the break done Smith some good? With the darts in this fourth set, his scoring improves slightly and he will have at least six darts from 132. Tops is the shot with three in hand, eventually taking out double 10. Scott Waites has now played 11 sets in World finals and lost only one of them. He's back after the break and four sets away from a second title. "Scott Waites hasn't given Jeff Smith a chance, he's outscored him. If Jeff does get a shot, it's a high one. Jeff is struggling with his scoring power and is trying to push the darts. He hasn't got the usual power." "I've noticed with the first three darts Waites throws, if he hits the treble 20 then he does well, if he hits a five, he struggles." More iffy scoring from Smith gives Waites an easy ride down to a finish, the first there against the darts. Waites come for 126 and has bull for the set... just outside. Still, he comes back for 25 and a 3-0 lead. Two at D8... yes! Scott Waites leads 3-0 and the music gives the Lakeside an excuse to party. Scotty is hotty, the Silencer on mute. "Scott Waites is punishing every Jeff Smith mistake at the moment." Smith will know a break could let him in and has found his scoring again, getting down to a finish after nine. He'll have a dip at 136. It doesn't go, so clinical Waites mops up with one dart at D20. Very, very impressive from Waites so far. He's one leg from a 3-0 lead. I spoke to Martin Adams in preparation for this final and he spoke of getting the crowd on your side. "They will support good darts, whoever's throwing them" said 'Wolfie'. Perhaps why Waites is getting the bigger of the cheers thus far. He's looking good for this two-set lead. Waites is averaging 92, while Smith is down in the mid-80s. He has to hold throw in this leg to have any chance not being 3-0 down at the break, but he's again struggling to find the T20 bed. Smith for 102 as Scotty waits on 68. D18? Yes! Huge dart for Smith. Chris Crispy McLaren: Letting the head rule the heart and going 7-5 Scott Waites but would love to see Jeff Smith win. I tell you what, Waites is cooking, while Smith is all over the place, like a maple leaf caught in the wind. There's a break after this set and the Canadian could be 3-0 down. Waites with the darts, opening with a maximum. Scotty for 95. D16? One dart in hand? Nailed the green bit! Waites is bossing this final at the moment. Waites has been jolted into life, opening what could be a crucial leg with his first maximum. Still Smith's scoring is shoddy, with Waites miles ahead. He has six from 122, and even six more from 68. D18 missed, but taken at the third attempt. Waites takes the second set against the Smith throw and is 2-0 up. The Tungsten Team: Jeff Smith has thrown some great darts and some terrible ones. Scott Waites hasn't been amazing but showing some consistency. Waites is livid with himself for not taking that chance to break, almost snarling through some groomed facial hair. Not rowdy in the Lakeside yet, just the odd smattering of polite applause. Waites needs double eight, but after two more misses, cleans up with double two. Dougal The Lab: Is it me or is World Darts final between a bloke from Huddersfield & Griff Rhys-Jones? Tony Theaker: Heart says, Scott waites to win the BDO title tonight, but more than sure, Jeff Smith is more than capable of causing an upset. Smith now with the darts in set two, so under pressure to hold throw. He's wayward, scoring deserting him, so Waites steals a march. The Yorkshireman is first to a finish as Smith gives himself a talking to. Waites on tops as Smith can't make an impression on 152. Waites misses his first double of the match - three of them in fact, but Smith can't take advantage. Three more missed by Waites, all at D5. Smith was nowhere, but gets out of jail on D8. This is a bit old school, but good fun nonetheless. Enter the Kingdom of Bobby George - chat like the BBC pundit, learn some moves and check out the darts calculator. Waites, in blue, has one gold star on his shirt for his one world title. With tungsten in hand for the set, he's down to 131 after nine. 91 leaves tops with Smith back in the 200s. No pressure from the Canadian, so Scotty for the set... taken with D20! Waites has hit three doubles from three arrows and takes the first set. One-hundred-and-eigh-ty! The first maximum of the night is thrown by Jeff Smith, who has this leg for the first set. Waites, goatee beard, responds with a 177 to get down to 24. Break back with D12? One shot is all that is needed. Very good standard so far. Waites back in control of the set. Now then, Smith has effectively pinched the arrows and is hunting a break. He will have a dip at 170, top of the shop. One T20, but the second is just a smidge too high. Still, he'll come for 72 for the break. Tops? Just too low. Waites is still miles back, though, and Smith seals a break with double 10. There was no sign of nerves from either player in the practice room before the match, and now not many signs of nerves on stage either. One solid finish each will have settled any lingering butterflies. Smith, slick-back hair and glasses, has the arrows. He's being pressured by some solid Waites scoring, but has a crack at 153. Very quiet in the Lakeside as Smith returns for D16. No trouble in the green bit. Both men hit their first shot at double. Waites makes the early running, keeping Smith at arm's length and just missing the first 180 of the match. On a finish after nine, coming for 72 while Smith waits on 70. Tops? Waites nails a double with his first attempt. Good start. We're under way. Waites has the darts in the first set. Seven the target. "I've got to go for Scott, he's been here before and he's got the t-shirt. He's a competitive guy." "A three dart finish will win this match. There is not much in their scoring, so it will come down to their finishing." "Playing in his first BDO World Championship final, the Silencer, Jeff Smith." Smith has the Tragically Hip's New Orleans Is Sinking as his walk-on. Obscure. "It's England's Scotty Too Hotty, Scott Waites!" A bit of the Fratellis for Waites, who is slapping so many hands on the way to the oche that he might not be able to hold his tungsten. It's not just the two players who are feeling nervous. Spare a thought for the two referees who will be calling the final, Marco Meijer and Antony Dundas, as well as master of ceremonies 'Little' Richard Ashdown. "I always get nervous," Richard tells me in the press room. "Have you saved something special for the final?" I ask. "Only the suit," he replies. Jeff Smith is on the practice board, playing alone, a man with his thoughts. The Lakeside is fit to burst and MC Richard Ashdown is about to take the stage. Forget the other finalist. This is the opponent that both players must conquer - a circular target 2.37m away, separated by a stretch of red carpet, and with three weapons in your hand to defeat it. Do so, and darting immortality awaits. "Scott Waites has had a few scary moments, but he's fought back several times." "Jeff Smith reached the semi-finals last year, and has got to final this year. He's a steady player but he hasn't been under that much pressure yet." "To throw or not to throw, that's the question." Bobby's jacket is an absolute stunner. Like a duvet with a henna tattoo. Not only is he sporting the sort of attire that could stop traffic, but the King of Bling is quoting Shakespeare's Henry V.
Right then, our TV colleagues have just taken to the airwaves from the Lakeside. You can tune your tellybox to BBC2, or stick with me and hit the live coverage tab at the top of this page. If you're wondering what the Dickens Christopher is talking about, 'the Silencer' is the nickname taken by Jeff Smith. Smith is an interesting character. From New Brunswick, he works in a car repair shop, fixing bodywork and paint jobs. Wayne Brett: Good luck Scott Waites. Let's see you raise the trophy again!!! Christopher: Good luck to The Silencer in tonight's final. Hope it's a classic. When I arrived about three hours ago, Lakeside was almost deserted. Standing on the stage, on my own, was a magical experience. Even with nobody else around, it was easy to get lost in the tradition of this place. Easy to imagine the cheers of a 1,500-strong crowd. Easy to recall childhood memories of January evenings in front of the television, watching some of the sport's greats win a world title. So I envy Scott Waites and Jeff Smith, who will get to experience all of that for real in a few minutes' time. This place will be rocking. So we've come to the end of the darting festive period. Two world championships over Christmas, one beginning when excitement was building, the other ending when the trees are long gone. Are you set for a spell of darting blues? Withdrawal symptoms? Do let me know. Predictions welcome too. Text 81111 or tweet using the hashtag #bbcdarts. Yep, it's the final of the BDO World Championships, Scott Waites versus Jeff Smith. Waites, the 2013 champion from Huddersfield, has made a habit of coming from behind, particuarly in his quarter-final win over number one seed and tournament favourite Glen Durrant. Canadian Smith is unseeded, but has pedigree. He reached the last four in 2015 and defeated three-time champion Martin Adams in the first round. It should be a belter. The FA Cup? Good, but not quite right. If you want the real sporting story this weekend, with the characters, the comebacks and the underdogs, then you need to turn your attention to the Lakeside County Club. For some, who you might not hear of for another 12 months, this is their time in the spotlight. A touch of magic, a hint of romance and the promise of a surprise. Drama, tension and excitement. All live on the BBC. The year is only 10 days old, but we're being treated to one of its great sporting weekends.